In June, 1985, my husband became a father. 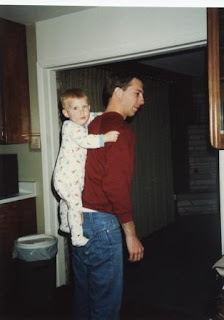 He liked being a dad and, even though he had no experience, he was actually quite good at it. And Curtis loved hanging out with his dad. 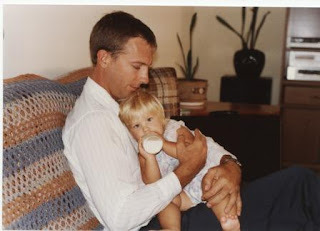 In 1988, hubby got to find out what it was like being a daddy to a little girl. He liked that, too. He worked hard to provide for his family, and I felt blessed that I was able to be a stay-at-home mom. We did the usual family things, picnics, vacations, school functions, dance and karate, and the kids managed to grow up without too much trauma. I think. Now that they are grown, I'm happy to see how their relationships with their father have evolved. They love and respect him, and they truly like to spend time with him. Hubby taught our son to fly an airplane. 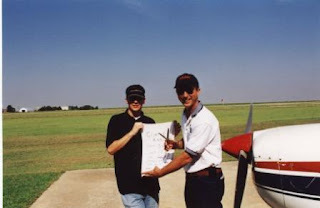 This was the day Curtis soloed. It's hard to say which one of them is more proud! So today, I would like to say Happy Father's Day to a dad who is always up for a good game of golf, Mario Kart or Guitar Hero. He's a guy who will go with you for a motorcycle ride, take a welding class with you, and teach you how to cut down a tree. To all you great dads out there, Happy Father's Day! I've got the most awesome parents ever. That's so sweet . . . what do you want? Just kidding. I'm glad you are a Mom and Dad girl. Oh, and Tiger just made the most awesome putt . . .
Hope you and the kids had a great day! jeff - Since he's only commented once in a year and a half, I think he wants his name out of it - although, he doesn't seem to mind having his pictures posted! We actually may get up to your gig on the 28th. I'm photographing a 20 year later vow renewal, but if the reception is over soon enough, we might get up there. Hope you had a good FD! Wow, just wow. That is incredible. "Oh brother, where art thou"? Hey I really liked this article.. sorry I am a little late but happy Father's day Dad, I love you.. I'm really looking forward to the boundary waters this weekend with you guys! !